M.Sc., M.Ed., N.E.T. (Education), PGDHE, Ph.D. The Research Cell aims to nurture research culture in the student teachers and faculties by encouraging research in newly emerging and challenging areas of Education and in its multidisciplinary fields like ICT, Psychology, Philosophy etc. This enhances the general research capability of budding technocrats by way of participating in conferences, seminars, workshops, project competition, etc. Research is the backbone of Education. 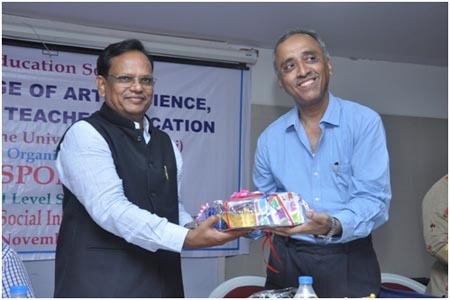 Research helps educationists to recognize and benefit the opportunities for collaboration, sharing of knowledge, innovative practices ad skills. 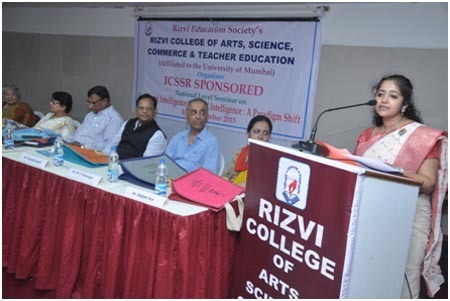 In order to provide every faculty member and student teachers with the latest skills and expertise in their area of interest, Rizvi College of Education has formed its Research Cell where in all our diverse teachers can share their expertise would in return enrich, enhance and help every faculty member and student teacher to grow to the optimum. Thus the Research Cell was established, with the objective of motivating and empowering every faculty member. To undertake research activities and development projects offered by agencies such as NCTE, UGC. 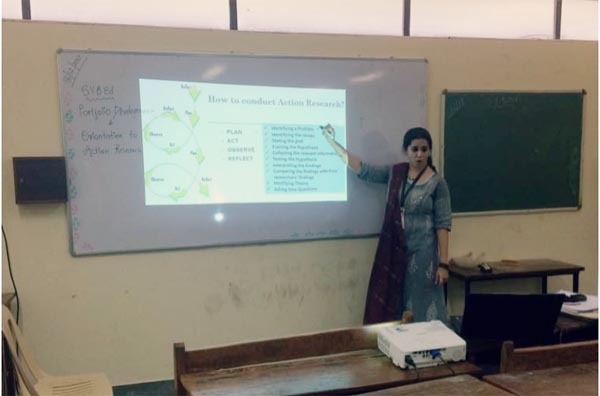 Research Cell members, Dr. Priyanka Pandey and Mrs. Pooja Manghirmalani Mishra conducted 6 workshops for the Action Research of the S.Y.B.Ed Students during their Semester IV. Workshops were conducted between December 2017 to March 2018. The first workshop discussed about Action Research and its process and importance. Consecutive workshops dealt with Chapterisation and practical process of data analysis. Session were conducted in the computer lab to give hands on experience to the students for performing data anlysis on excel sheets and preparing graphs. 8 students published their Action Research findings as Research Paper in International Journals. 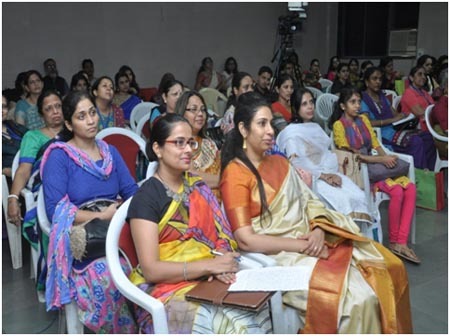 Below are a few glimpses of the workshops. 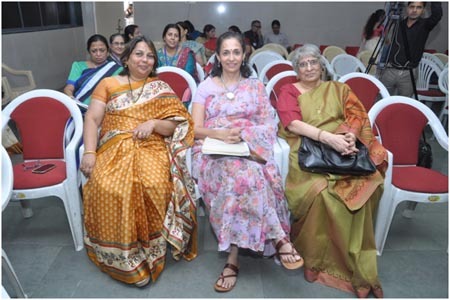 2) National Conference titled Ethnography of Education: Reconnecting the Neurons of Indian Education System, 6th and 7th April, 2018. Ethnography refers to the scientific description of people along with their customs, habits and mutual differences. Ethnography of Education aims at merging the differences in the Indian Education System through re-establishing the paradigms of Education. These differences may have ascended due to culture, customs, habits, environment, attitude and sometimes even the aptitude of student teachers. This National Multi-Disciplinary Conference is for exploring the philosophies that have created this ethnographic transition and to propose solutions to reconnect the gaps. As teachers, coaches and parents everywhere like to say: ‘Practice makes Perfect’, doing something over and over again doesn’t just make it easier, it actually changes the brain. Neurons grow, they form connections with new neurons. Similarly, the Indian Education system has to rewire itself, change over the course of time and grow. For the Education system to undergo this rewiring, the teacher community needs to actively look at certain dimensions of teaching/learning, assessments, innovations and so on. To rediscover our educational philosophies, we need to change the lens through which we view them. Following were the sub-themes for the conference. The conference was spread over the span of two days. 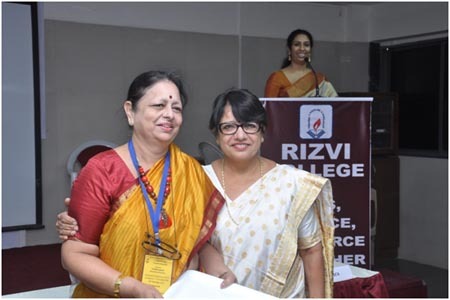 On the first day, the inauguration was done by our chief guests, Dr. Indu Garg (retired Professor from Department of Education, University of Mumbai), Dr. Hemlata Chari (retired deputy Director, IDOL, University of Mumbai), Prof. Paul Raj (I/c Principal, Rizvi College of Arts, Science and Commerce), Ms. Asllesha Thakur (Director of LEAD Innovative, New Delhi) and the Convenor and I/c Principal of Rizvi College of Education, Dr. Radhika Vakharia. The theme of the conference was discussed in the inauguration and each guest shared their view point. The key note address followed the inauguration. 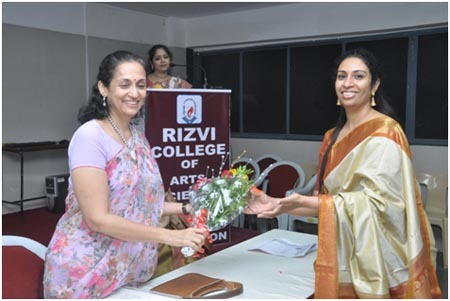 It was conducted by Ms. Thakur in the form of the workshop. Through this session, she discussed and deliberated upon the eight sub-themes of the conference and conducted several activities like Bingo and Think-Pair and Share. The second half of the day was dedicated for paper presentations where some benchmark research work like leveraging EQ, Psychotherapy and meditation, Assessment of EQ and leveraging weaker skill, Study of Metacognition and Procrastination were presented. some sensitive issues like Bullying and its relationships and Inclusiveness and LD remediation were brought about in a new light. 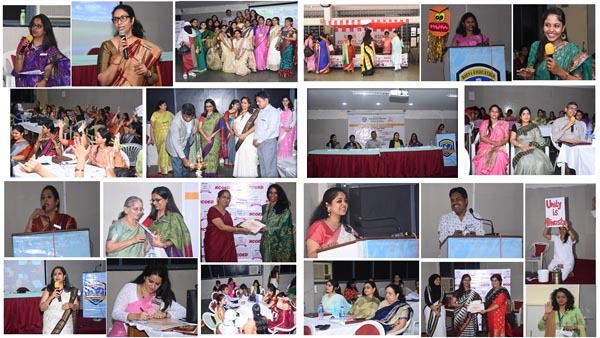 Day two began with the very interesting workshop titled STEM to STEAM Integrating the Art of Storytelling into Teaching conducted by Dr. Radhika Vakharia, Mrs. Spoty Karthik, Mrs. Nahida Mandviwala, Dr. Priyanka Pandey, Dr. Rakhi Sawlane and Mrs. Pooja Manghirmalani Mishra. It was full of digital narrative stories, great props and a lot of food for thought. The session ended with a psychosomatic meditation where the 5 chapters of life were discussed. 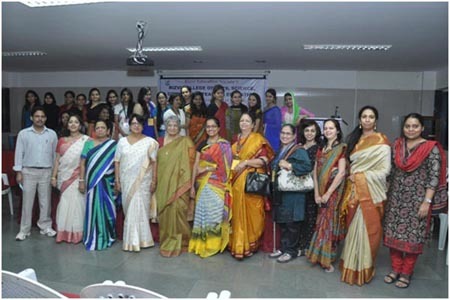 The workshop was followed by pre-lunch paper presentations chaired by Dr. Asawari Gudipudi, Dean, MIT and the post lunch paper presentation session was chaired by Dr. Deepti Mankad, Founder and Director of Mind-Speak. The reconnection of Neurons had taken place beautifully and RCOED hopes that the published work will reach far and wide and the propositions are appreciated and accepted. Research is the backbone of Education. Research helps educationists to recognize and benefit the opportunities for collaboration, sharing of knowledge, innovative practices and skills. 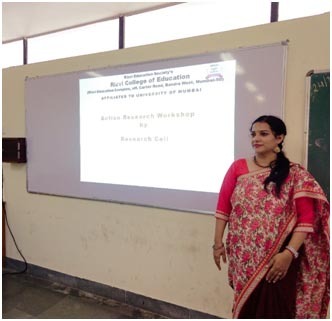 Research cell of Rizvi College of Education organised a session on Orientation of Action Research on 9th December for their S.Y.B.Ed Students. The session covered the importance of conducting an Action Research, its proper format, its content writeup and documentation. Various topics and need for Action Research will also be discussed in this session. 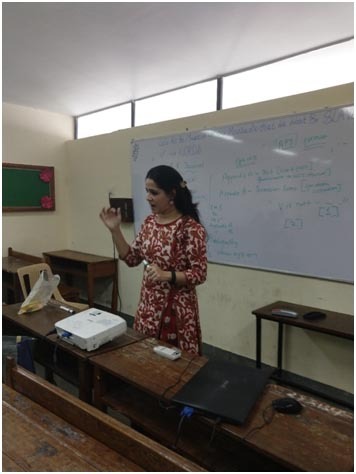 The session was conducted by Mrs. Pooja Manghirmalani-Mishra, faculty in-charges of Research Cell and expert in this domain. Principal, Dr. Radhika Vakharia and faculty member Mrs. Pooja Manghirmalani-Mishra presented their research papers at Educarnival , the 9th International Conference for School Leaders & Teachers 2017 organised and conducted by IIT Delhi from 21st to 23rd December 2017. Dr. Vakharia presented her work on Wellness and Reflection whereas Mrs. Mishra presented and demonstrated her model of Intelligent Agents used for Learning Disability remediation. Both the research papers were greatly appreciated and both were presented with appreciation awards in research fields by IIT Delhi. 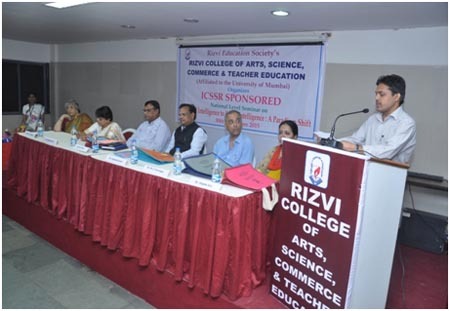 Rizvi College of Education along with Indian Council of Social Science Research, Mumbai organized a one-day National Research Seminar. Venue: Rizvi College of Education, Rizvi Educational Complex, Off. Carter Rd, Bandra (West), Mumbai 50. A Study of a Model on the Emotional Intelligence as A Determinant of Organizational Climate. Real vs. Virtual: Is Social Networking Sabotaging Real Communication and Are Human Relations under Siege?